For the first time since monitoring began in 1985, there will be no official measurement of the Gulf of Mexico’s dead zone. Late last week, the National Oceanic and Atmospheric Administration (NOAA) made a disappointing announcement: due to mechanical ship problems, this year’s dead zone monitoring mission had to be cancelled. This matters because without a full assessment, it is unclear how much closer we are to solving the problem. That’s the bad news. The good news is that we already know how to cost-effectively reduce water pollution. 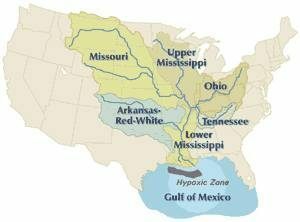 A quick refresh on the basics of dead zones: A hypoxic zone or “dead zone” often occurs where a major river meets an ocean. 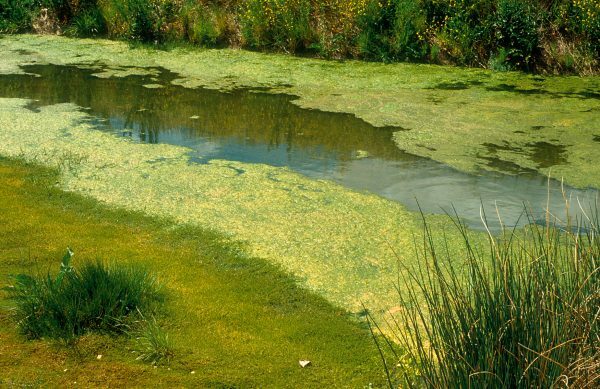 Pollutants that run downstream feed the growth of aquatic algae. These dead and decaying algae starve the underlying water of oxygen, essentially choking the marine life below it, earning the dead zone nickname. We rely on major waterways for drinking water, food, and business, so when dead zones spread, fishing and tourism industries suffer. 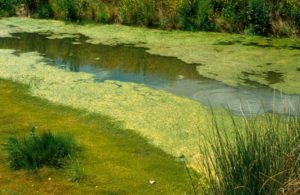 The major pollutants that feed those algae are nitrogen and phosphorus, which also happen to be major nutrients applied as fertilizer to the crops that grow upstream. In June, NOAA released a prediction for the dead zone, estimating it to be “average” at approximately 6,000 square miles, or the size of Connecticut. Even without a more official measurement this year, when “average” is enormous, it shouldn’t be accepted as normal. I said it in my last post on the dead zone forecast and I’ll say it again: although fertilizer from the Corn Belt is often made out to be the big bad culprit as to why the Gulf’s dead zone isn’t getting smaller, the problem is about much more than fertilizer. It’s also about bare exposed soil (soil without plants actively taking up nitrogen and phosphorus), which lets those critical crop nutrients wash downstream to spots where they are no longer nutrients but rather unwanted pollutants. And in most of the Corn Belt, which feeds the Mississippi River and ultimately the Gulf of Mexico, you’re hard pressed to find plants growing outside of corn season, which only lasts from mid-spring through early fall, just five to six months a year. The idea of incorporating plants that grow year round – perennials – into agriculture is needed and represents one promising option to reducing water pollution. New research perfectly articulates this point, through the lens of perennial crops that can be grown for bioenergy, mainly the hardy and versatile perennial grasses switchgrass and miscanthus. A paper published earlier this summer by Andy VanLoocke at Iowa State University and other colleagues used computer simulations to answer the question: if we substituted the land currently used for corn ethanol with alternative bioenergy crops, how much could we improve water pollution? What they found was that if we replaced 40% of the corn acreage (the current percent that goes to corn ethanol) with perennial bioenergy plants, it would reduce the nitrogen lost to waterways by 15-20%, which could help get about halfway toward meeting the Environmental Protection Agency’s goal for shrinking the dead zone. That goal is to reduce the dead zone size to 1900 square miles, and in 2008 when this goal was set, the target date to meet it was by 2015. However, because annual measurements consistently came in greater than that goal, it had to be extended to 2035. And again, without a 2016 measurement, we cannot determine how much further we have to get there. We spend a lot of taxpayer dollars on farming practices that contribute to problems that cost us even more down the line. Every summer, news of the dead zone in the Gulf of Mexico furthers the case that something needs to change. A recent study estimated that nitrogen from agriculture costs Americans $157 billion a year in damages to both human health and the environment This is more than twice the $76.7 billion total value of the US corn crop produced in 2011, when prices of corn and other agricultural commodities were strong. Earlier this year, the Department of Agriculture estimated that commodity growers will receive their biggest crop insurance payoffs since 2006, at $13.9 billion. That would mean that 25% of the nation’s net farm income in 2016 would come from these federal payments. To illustrate Congress’s role in perpetuating an inefficient system, we did a quick scan of how members of Congress in the ten states that border the Mississippi River voted in 2012 on a basic reform to the Federal Crop Insurance Program. The reform – known as conservation compliance – requires producers who receive federal support to implement basic best management practices in protecting wetlands and highly erodible land, which has many benefits including helping protect against water pollution. We found that a disappointing 55% of Senators in the Mississippi River-bordering states voted against this common-sense reform. The House of Representatives thought so little of conservation compliance that they didn’t even bring it to a vote in 2012. The provision ultimately became law in February 2014 in spite of farm state opposition. To me, requiring producers to protect our natural resources in exchange for federal support is as straightforward as wearing a seat belt to be eligible for car insurance. The dead zone is a reminder that we already invest a lot of public dollars in a system that continues to produce many of the same problematic outcomes year after year. The current situation is that farm income is historically low and pollution is still too high. We ought to be looking for win-win policies that support farmers’ bottom lines and the environment, rather than encouraging more of the same annual crops that lead to chronic pollution headlines.